FCI # 167, Origin: the United States of America, Group 8.3 Flushing Dogs. Grooming: High, Shedding: Low, Coat: Silky, flat or wavy. Color: Any solid color, black and tan, parti-color, merle. Ease of training: Medium, Energy level: High, Span of life: 12-15 years. Breed: The family of Spaniels is big and old.? ?Already in 1368 we can find the mentionings of Spaniels, which were then divided into two groups - land and water. The further division was occurred by size, when Cockers and very small (Toy) Spaniels were separated from the larger dogs.? ?Then, considering that the Cockers and the Toy Spaniels were used in an entirely different purposes, they were separated again. Eventually ? ?the English Toy Spaniels became a lap dogs, that were kept mostly indoors, and the Cocker Spaniels have remained, as before, the hunting dogs.? ?That's why they're called sometimes the youngest members of the Retriever group. American Cocker Spaniel - the smallest sporting dog, is very popular in his homeland.? ?Different kinds of Spaniels appeared in America even before the emergence of the United States. Later already existing English Cocker Spaniels were imported to the United States, but ? ?American hunters decided to have their own breed, different from the original, and focused on the targeted selection.? ?So actually, the American Cocker Spaniel was bred directly from his English cousin by a special selection of the desired qualities.? ?Despite the fact that the breeding of an English Cockers in America began in the XVIII century, the American Cocker Spaniel as a breed was first exhibited in Manchester (New Hampshire, USA) in September 1883. His beautiful appearance and excellent hunting qualities attracted a lot of? ?attention, the breed immediately got many admirers, the popularity of American Cocker Spaniels began to grow rapidly not only in the U.S. but also in the other countries. 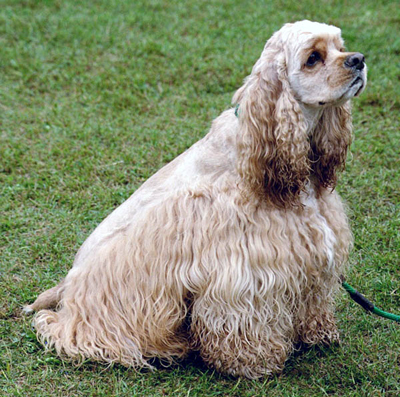 The formation of this breed was very much supported by the English Cocker Spaniel Club, founded in 1935.? 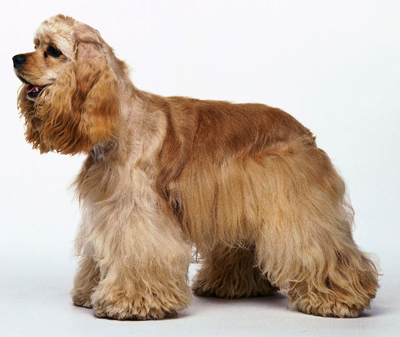 ?However, the complete separation of the American Cocker Spaniel as a breed occurred around 1945. General Features: American Cocker Spaniel is a small dog with the strong type of constitution, ? ?balanced temperament, courageous, lively, very easy to train. Long and abundant coat distinguishes this breed from the rest of the Spaniels.? ?The coat is silky, shiny, straight or slightly wavy, with the rich undercoat. For the show dogs it must be long, especially on the chest, ears, belly and legs. This kind of coat requires a special care, trimming and cutting.? ?Colors are quite varied: solid colors (black, red, yellow, brown) with no white markings, black and tan, parti-color and tri-color - black and white with tan. American Cocker Spaniel has a sturdy and compact body in shape of a square, well muscled, with a beautifully set head and a long neck.? ?Head with a rounded dome-shaped skull, a sharp transition from forehead to muzzle, muzzle broad, blunt, upper lip covers the lower jaw, snout is about one-third of the head length.? ?Ears drooping, long, wide, thin, low set.? ?Tail is set high, docked for about a half. The dog is holding it just above the back line and the tail is in constant motion, if the dog is awake. Temperament: From their hunting ancestors the American Cocker Spaniels inherited intelligence and independence. American Cocker? ?is momentarily oriented in the situation, and especially in the situation of the family, where he lives. He? ?quickly learns the overall style and atmosphere, the rhythm of the family life and he is making everything just to fit.? ?He will never be confused by the need to behave differently with different family members - most importantly, that everyone will be happy.? ?If you love to play - the American Cocker will be joyful and always ready to play with you and your children. If you are tired - he will not mind just to sit quietly beside your feet.? ?You came home in a bad mood - well, Cocker will not be? ?annoying, asking for your attention, he will just??wag? ?his tail from a distance. However, he is always quietly watching you - you may not even pay attention and never notice his suffering and pleading eyes.? ?But if you suddenly look at your Cocker, calmly lying on the couch, you'll notice that his tail is already??slightly? ?wagging, but the dog is not even raising his head. The amazing ability of American Cocker - not to beg for the communication, but gladly respond to it.? ?If for once you have no time to play with him, you do not have a sense of guilt towards your pet - he will get himself busy with something else without any disappointment: he will chew his toy, talk to the cat, stare for some time in the window or just take a sweet nap on the sofa.? ?And you even somehow do not notice his need to be beside you. But? ?suddenly you see, moving from the living room to the kitchen, that after only a couple of minutes your Cocker is already sleeping peacefully under the kitchen table, seemingly by himself, without any reference to you.? ?Only his tail is slightly moving in response to your glance. American Cocker has his own - very specific - way to accept the punishment. While loving his owners, he is not inclined to forget about his own person.? ?And he has a completely independent view of the world. His intelligence allows Cocker to understand "what is true and what is false" ? ?- what is not really allowed to do and what is just his owner's "moody"??decision.? ?And here you have to be firm and? ?strict, showing your will to the American Cocker. He has to know, that some of his naughty behaviors will certainly be punished.? ?However, our hero - Cocker does not take offense, never "apologizes" and never walks with the "beaten looks."? ?He takes the punishment, as we take rain, from which we can not hide.? ?It's unpleasant, but then it ends anyway.? ?And once you've stopped being angry - everything is forgotten at once. You will never notice a particular jealousy in Cockers - they gladly accept the company of the other animals and do not suffer from the fact that the owner divides his attention between several pets.? ?Apparently, the American Cocker is so sure, that everyone around loves him, that he is never experiencing the feelings of inferiority in such cases.? ?Cocker will never suspect, that someone new will be more loved by the owner, than himself. He just makes a new friend, who also will love him, just like anyone else does.? ?And usually the things go exactly this way!? ?Well, if someone suddenly growls or hisses - it means that he has not appreciated the charm of a ? ?Cocker yet.? ?As the time will pass - everything will be better. Energetic, easy to train, intelligent, loyal, and - as you can say, looking at his little wagging tail - always optimistic, the American Cocker Spaniel today - is the most beloved American dog number 2 in the books of the American Kennel Club. Health problems: The American Cocker Spaniels may have different problems with their eyes (glaucoma, cataracts) and ears (otitis). In some lines the hip dysplasia may be an issue.